It’s the film’s bloated third act that wears you out, including an obligatory set-piece that results in mass destruction. At 2 hours and 22 minutes, The Amazing Spider-Man 2 is far too long, and seldom feels urgent. The sparkling lightness of the first half is lost somewhere in the messy plotting of the second. Yet, Webb shrewdly brings down the curtains leaving you once again invested in the central romance over anything else in the film. I’m going with three-and-a-half out of five. This is that rare love story disguised as a big-budget superhero film. The Amazing Spider-Man 2 didn’t seem new or startling enough. Neither did it leave me breathless with excitement – which is the least that I demand from my superheroes these days. And yet, The Amazing Spider-Man 2 isn’t an abject failure. Director Marc Webb keeps the narrative wheels churning hard with a multitude of villains. The Amazing Spider-Man 2 works in fits and starts. I recommend that you watch it for its gorgeous leads but have patience – it’s long and in places, not entirely amazing. I’m going with three stars. What sets Marc Webb’s iteration of the web-slinger’s story apart from Spider-Man’s previous cinematic outings (and indeed, other superhero films) is that along with its share of action, epic fights and special effects, there is a vibrant, emotional core at the heart of this movie. The action sequences are breathtaking and despite the running time, the film doesn’t drag. Garfield and Stone, in the scenes where they are together, have a palpable chemistry. This Spider-Man serves up both pathos and power. This is an unforgivably boring film, and while it may not seem as instantly objectionable as Sam Raimi’s monstrous Spider-Man 3, it must be marked that at least the older film failed because of ambition, because of trying to do too much. Webb’s new film, on the other hand, is inexplicably slow and torpid, a haphazard and amateurish affair where the seams show all too glaringly. Save for a couple of relatively funny lines — and the devastating climax — there is nothing worth remembering in this painfully generic film.This is malarkey, malarkey that bores for eighty minutes before coming to life somewhat during the last hour. The Amazing Spider-Man 2 is much better than the first movie. But then we need to get into semantics, because the first movie was absolutely awful and unwatchable. This one is bigger, more colorful and more action packed, but those three things are never enough to make a film amazing.The structure of the entire film is simply this: big action scene, followed by a pop song to the backdrop of Peter Parker-Gwen Stacy bittersweet romance. The first two times it’s nice to look at, but it happens over and over and over again until you stop caring. The performances, story-line and pacing of the film are great, but what really sets it apart is the direction, choreography of the action sequences and the next level visual effects. The film is a well written, true to the comics, adaptation of one of one of Marvel’s on the ground soldiers. Fans of the first movie, and superhero movies in general should definitely go for this one. PS: There’s an X-Men: Days of Future Past scene at the end of the movie you wouldn’t want to miss. The Amazing Spider-Man 2 comes with two villains with just enough character and enough acting abilities to make the contest worthwhile. Webb also overstretches Garfield’s welcome, dragging the film well past two hours and giving a teaser to the intended sequel before coming to a, literally, clanking halt. Watch or Not? : Hell yeah! When it’s a film called The Amaizng Spiderman 2, this section mandatorily reads Du’uh Of course. The film’s staple problems persist – the tedious running time and the presence of multiple subplots that must coherently be infused in the story. Marc Webb handles the flaws valiantly depending rightfully on the formidable chemistry of Andrew Garfield and Emma Stone who indeed offer everything value for the buck. The standard and familiar storyline doesn’t bother much when what you have to watch is essentially crackling fun. The Amazing Spider-Man 2 is a superhero film yet also brings out a unique a love story.The special effects in this film will blow your mind. Jamie Foxx as Electro delivers a power-packed performance, literally. We are in 2014 and may be that’s the reason Spider-Man is much cooler and also, has a good sense of humor. Expectations can and should be high for such big-ticket films but also, realistic because at the end of the day it is nothing but a Hollywood comic book superhero film. If Spider-Man can do all the jumping around, fly, save his city from all kinds of villains and romance like a true lover, he indeed is amazing! The high voltage action is crunchy and the 3D Dolby sound adds to the fury. Technically a marvel as it should be ‘The Amazing Spider – Man 2’ charms extra with the undeniably remarkable chemistry between Andrew Garfield and Emma Stone. It’s more familiar and comparatively less ambitious. Some actions nerds may want more. Designed to thrill, please and charm Sony Pictures ‘The Amazing Spider – Man 2’ By Marc Webb is powered by super casting that fulfills the responsibility to satisfy the audience of this genre having all the ‘conventional’ potential to turn infectious to its diehards. The biggest hitch with the action film is that the villains seem futile and feeble. We all know that the lanky, flexible Spider-Man will tackle his enemies especially since a real sense of their power and threat is never established. 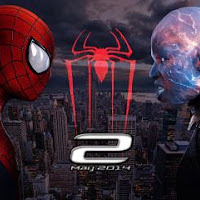 Of the action sequences, the most thrilling is the face-off between Electro and Spider-Man at Times Square. Simply put, this Spider-Man has little to offer that truly amazes you.